The Middle School curriculum for students in Grades 5–8 is designed to be responsive to our students’ developmental needs and moral development as well as to spark their interests and imaginations. The curriculum is challenging and encourages students to become active participants in the teaching-learning process. We want students to learn, to become intellectually engaged, and to behave as responsible citizens. We expect our students to develop initiative and responsibility so they can reach their potential. Students are expected to master skills in the core subjects of language arts, math, science and social studies. They become competent users of technology in their studies and continue to build a solid foundation in Spanish. Life skills, health, and physical education classes engage students in learning about themselves, relationships with others, goal-setting, and team work. Music and art classes round out the Middle School program. Students attend Chapel and Eucharist on a weekly basis. In addition, students take part in outreach activities in the community through service projects. Students participate in CHOICES, where they determine whether to join a club, work on homework or independent study, use the computer and text resources of the library, request extra help or advice from their teachers, or participate in a service project. Language arts, math, social studies and science are taught daily for at least 50 minutes. 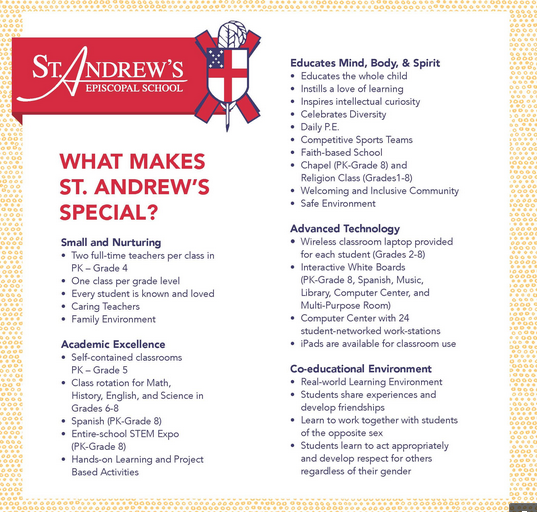 Daily physical education classes, two music classes, one health class, one life skills class, one extended art class, and three Chapels are offered weekly. Interscholastic athletic teams compete with other schools in the metropolitan New Orleans area. Middle School students have opportunities to enter state and regional competitions in math, science, and geography.